Did you know your nose is a filter that is constantly cleaning out the toxins, dirt, and debris that we inhale at every moment. Blech! For centuries around the world, sinus washing was a daily ritual (kind of like brushing our teeth) performed to keep the sinuses clean. I know what you are thinking. Put water in my nose? 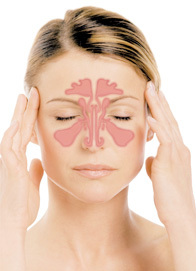 Sinus cleansing is safe easy to use and has no side effects. 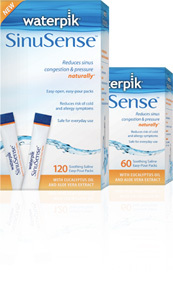 As a runner, mother, subway commuter, allergic to almost anything person, I recommend Waterpik® SinuSense™ as your sinus cleansing product. These products are easy to use and provide you relief, both long term and short term. I can say I no longer suffer from allergies like I used to. Mandatory Entry: Visit Waterpik® SinuSense™ and leave a comment telling me which product would you like to try? Be sure to leave a valid e-mail address somewhere in the comment so that I can email you if you win! *Like Waterpik® on Facebook and tell them I sent you. This giveaway ends November 7, 2010. Winner will be chosen randomly and will be announced here and also by email. This giveaway is open for U.S. residents only. Disclosure: A big thank you to Lisa of New York Chica for inviting me to this awesome and informative event. All products mentioned in this post are safe for daily use for ages 4 and up. The Pulsator is only for ages 6 and up. 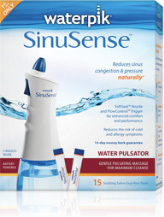 I was provided with Waterpik Sinusense products for review purposes only. All opinions are 100% my own.